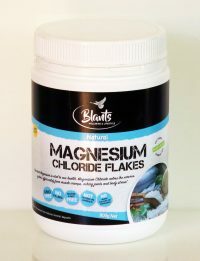 Our Natural Magnesium Chloride Flakes are harvested from the Dead Sea – a deep lake with abundant ancient mineral deposits. This salt is harvested naturally, and dried naturally utilizing natural solar energy, concentrating the salt to a level much higher than you will typically find in other brands. 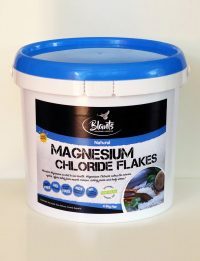 We source from a supplier that produces a high-quality magnesium chloride, but chooses to save on production costs by not having the salt graded as ‘food grade’. It is, however, independently analysed to the same high standards as food grade specifications, so we know it is top quality, but we can keep the price lower for you. There are No fillers or additives, No flow agents, No added colours, No added fragrance, Non GMO, Fumigation free, Not tested on animals, Vegan Friendly, Allergen Free, Gluten and Nut free. 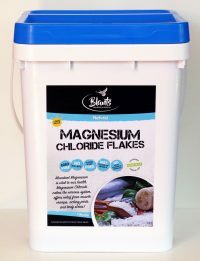 Magnesium Chloride Flakes may be used in bath soaks, salt scrubs, foot soaks, combine with essential oils, and in other applications – ideal for business owners, and for private individuals for home use. 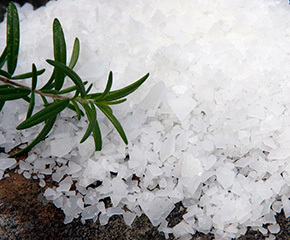 Add 2 – 3 cups of Magnesium Chloride Flakes to a warm bath and soak for at least 20 minutes. You can also mix the Magnesium Flakes with our Sodium Bicarbonate in your bath. You can add ½ cup of flakes to a foot spa or tub of warm water and enjoy a reviving foot soak. For wholesale and bulk salts, please contact us.